Born roughly between the years 1980 and 2000, Millennials make up more than a quarter of the U.S. population. They’re currently the largest generation in the U.S. labor force, according to the Pew Research Center, and they’re well on their way to becoming the largest group in the in-home care workforce as well. That said, Millennials have developed a notorious reputation as difficult employees. Anecdotes swirl among HR managers about Millennials who show up for interviews accompanied by their mothers, who feel entitled to large raises and promotions without earning them, or who hop from job to job with no loyalty to any employer. They’re digital natives who are supremely at ease with technology in any form. They work as hard, if not harder, than other generations – 73% of Millennials say they work more than 40 hours a week, and almost a quarter of them work over 50 hours. They’re the best-educated group of young adults ever, and they’ve grown up in a school environment that has favored group projects and non-traditional learning environments. This means as employees they’re quite comfortable with teamwork, collaborative problem solving, and thinking on their feet and outside the box. They’re also the most racially diverse generation in U.S. history. As a result, they fit right in with co-workers from all walks of life – a plus for home care, given the industry’s nearly 550,000 immigrant workers. 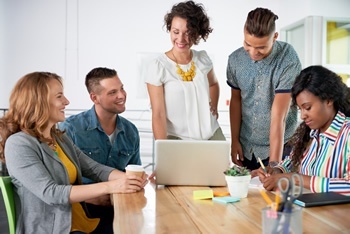 But they do have a different set of life experiences than Generation X or Baby Boomer employees, which means they bring a different perspective to the workplace and therefore need to be managed in different ways. Fortunately, simply being aware of how Millennials are different is often half the battle. From there, the best approach is to make subtle adaptions to fit this next generation’s work style. Millennials want to make an impact with their work. In a Deloitte survey, 60% of Millennials stated that having a sense of purpose is a key reason they choose to work for a company. The home care industry is already innately mission-driven. The key, therefore, is to communicate that purpose to employees. Agencies should share their “why” – the story behind why the agency was created, and why the agency strives to serve its chosen population. This will help forge a stronger work culture that will more readily attract Millennials who share those values and ideals. Millennials have big career goals, and they’re ready to work hard to achieve them. However, it helps when they understand what success looks like. On a micro-level, this means agencies need to provide their Millennial employees with clear expectations for their roles, including a clear definition of desired outcomes. How agencies communicate this is important; it’s helpful to provide rationales for a given task, rather than simply barking orders. This lets the Millennial understand how the task fits into the larger mission, making the employee feel like a true team member. A high-touch approach works well with Millennials. After all, they’re still young. They won’t have the same level of hands-on experience older employees bring, so they need opportunities to learn. In fact, 93% of Millennials want lifelong learning, and four out of five say the opportunity to learn new skills is a top factor when choosing an employer. Too often, though, employee performance reviews are conducted only a handful of times each year. Instead, agencies may do better by looking for more frequent “micro-moments” for feedback and mentoring. Having access to specific performance and clinical outcome data is also extremely valuable, as it arms the employee’s manager with objective, quantifiable feedback rather than subjective opinion. It’s worth noting that a common complaint among managers of Millennials is a perceived arrogance. But rather than putting them “in their place,” Don Charlton at inc.com suggests flipping the script with questions like, “What data do you have to prove that?” This forces the Millennial to think analytically, not anecdotally – and turns the occasion into an important learning moment. Ultimately, one of the worst things an agency can do is trivialize their Millennial employees. Instead, agencies need to look beyond the stereotype and remember that, although Millennials may have different skill sets and viewpoints, at the end of the day, they’re really not all that different from any other generation. If you’re interested in building a more connected, cohesive workforce in your agency, you may be interested in watching our on-demand webinar: 8 Tips to Keep Your Remote Home Care Workers in the Communication Loop and Feeling Connected.